"Absolutely awesome 3D CAD software"
The user interface and rendering engines are absolutely fantastic, I can design in 3D faster and easier with this product that I can with every other CAD product I've used in the past. I like that you can break down an object into it's components and then create 2D CAD drawings directly from those components ready for making them. I also really like the timeline and that you can go back and edit something and those changes then flow through your whole design. There are not enough material appearances available,, sometimes I would like to use materials for background or scene objects but they're just not available (eg brick, concrete, flooring types etc). Don't hesitate, go and download the trial today. Fusion 360 is absolutely awesome. I sue Fusion 360 to design wooden furniture, boxes, tooling, gadgets and even fabric items such as luggage. It's really quick to go from and idea to a visualisation and then to component drawings. The renderings are incredibly accurate when compared with the finished real product. "The best CAD software for any user. " What I feel is best, is the intuitiveness of the program. Being the first CAD program I learned, the tools were easy to learn and understand, and the more I used the program, the more ambitious I became to explore and grow as much as possible. Learning Fusion allowed me to learn other programs while enrolled in University and got me hungry to improve, learn and grow within the program itself. I dislike that there is no real algorithmic integration for Mac Users. I know dynamo is for windows and is available, but simple things like adding textures or patterns would be a nice addition if possible. One of if not the most versatile CAD platforms currently available on the market to all experience levels. The fact that high school students are using this program before attending university, is a testament to the wide market this product appeals to. I know there are a lot, but I feel I am not qualified to answer this. "Fusion 360 CAD CAM with Eagle"
Complete integrated package that combines mechanical 3D modeling with CAM so I can create G code to operate the Milling Machine, Lathe, CNC 2D Plasma, 3D Printer. Integration with Eagle PCB Design software allowing import of 3D model of the PCB's designed in Autodesk Eagle. Cloud storage so designs can be shared between team members and when I'm working from locations other than the main business office. Massive YouTube tutorial base from Autodesk and others. 1) I'm nervous about Cloud storage security. 2) The trend for engineering software is moving to subscription based software. This is both good and bad. The good is that a full blown software package is only $310 per year ( I was an early adopter, your price may vary). This is a great price compared to $15,000 for our previous software. The bad is you need to continue to pay every year to maintain ability to use or modify your designs. So far, I am very happy with the Fusion 360 CAD / CAM integration. It's great to have one product that include both design and creation of CNC G code to run our machines. Still early in the stages of using it with Eagle PCB design software, but so far it's working great. 3D Cad design of electronic assemblies, enclosures including Printed Circuit board modeling. Creation of G code to drive our CNC Mill and CNC Lathe. "Learning how to use the tool and teach others"
I like the power of the platform and how similar it is to using Inventor. Being able to take a design and send it to a 3D printer, or run it to the CNC, or to create an animation helps me teach design and manufacturing concepts to the High School Students I mentor. 1. The learning curve and the paradigm shift. I am a 2+ decads user of AutoCAD 2D tools - I still use them in my professional work. So using the sketch and the extrusion tools is a gear shift that took time to overcome. 2. It appears that Students using the application can't share the files I create in my hobbyist/start-up mode system. Of at least I have not figured out how to do it. Super Powerful, but a steep learning curve. For my business, I am working on a number of R&D applications for robotic grippers and machine interfaces. I also mentor a FIRST FRC Robotics team and use the platform to develop designs with the students on the team. Several of the students also use Fusion360 for design and development work for the team robot. "Perfect for small start-ups and large corporations"
The value for Fusion 360 is unbeatable. I worked at an academic entrepreneurial institute and we emphasized principles of thrift but hypocritically taught 3D design and analysis with expensive CAD packages. Good luck with that when you go out on your own and have to start paying for software. The value for Fusion 360 is incredible. I don't know how they offer it at such low of a price with all of the capabilities and features that it has. I have been using it for over a year and there is nothing so far that I dislike. Do it! I want to see this pricing strategy for Fusion 360 to succeed. I hope they make a lot of money on all of the other strategies they have so that it is a success and adopted by enough users to make it sustainable. Autodesk must have put alot of money into its development and I hope that they get the volume of users to make it happen. In my start-up we have reduced the our software expenses significantly. In addition, as a small start-up we work remotely so the collaboration and online platform have saved us time and money. "Growing business, a huge variety of different parts - no problem for Fusion 360!" We really got hooked on the workflow. It's all set up in a way that Everything makes sense. I use Fusion 360 mainly for the CAM-Environment - I make my DMG DMU 75 run parts every day of the week using only Fusion 360. The only thing I really dislike is the fact that I can't run a custom form tool in multi-axis Flow. But I mean, that's something I can live without but it would be pretty cool if it becomes available in a future update. Just give it a shot, I mean - they offer a free trial. I think most of the people who are willing to try it out won't get dissappointed. We don't have to deal with local or server storage for all our files anymore, that's something that helps us along the way. I work alot during the evenings at home, preparing new programs to be run - with all files being cloud stored this is really simple to achieve. The guys working at the shop floor also really like how easy the software is to use. We have become that much faster at making programs, on the go, at the floor that we don't even see it as a problem anymore. "Fusion 360 - the future of CAD systems"
Fusion 360 has some serious features which really make it stand out from other CAD systems. While each one has its benefits and downsides, Fusion has some features which other CAD systems are nowhere near having. Mainly things such as the Cloud capability. I can access all my files from anywhere in the world, on any computer, also there are IOS apps so you can take your designs with you on the go, which I have done when I have visited clients, I have taken my iPad and shown them the designs in 3D. I also like the fact it has multiple features already built into the package - such as CAM and analysis software. Then finally, it's great value, there's no crippling seat fees and annual subscriptions into the thousands, All in all it's great for small and large businesses a like, and also great for hobbyists and students to learn on. Suitability to HD oversize screens - every update (this may have been fixed now, I'm not sure) the interface errors out when you initially run Fusion 360 on it, and makes it unusable. There is a fix for this, but it's quite laborious, and tedious as it has to be "fixed" after every update. Lastly, the CTRL to orbit is so annoying and unnatural. This is a must change in your preferences so that you can orbit a model around properly with just the mouse. I am able to render designs for use in demonstrations for clients. The render tool is really easy to use and looks great. I am also able to keep all my files in an ISO-style directory, all stored in the cloud, rather than being worried about storing clients details on a HDD or server. "Best CAD software so far!" Fusion 360 provides analysis, modelling, sculpting, rendering features under one roof. 3D Yug being a product design firm keeps exploring Fusion 360 features for it's rendering, cloud based file sharing purpose. This helps clients see the designs on the go from any platform. There is nothing in Fusion you can dislike. Being an active Fusion user, I think Fusion team provides feedback of your dislikes/issues through improved software updates everytime. Also, Fusion social media handles are greatly helpful for all from beginners to pro level users in all matters. 3D Yug is focussed on product design and manufacturing in India. Clients keep providing feedback on problems faced by Indian consumers, which help us develop a product made for India, in India! Being in a competitive market, Fusion helps to give best of products through revisions, analysis and quality renders in no time under one roof. "Powerful 2D/3D design tool, with some limitations"
Adobe Fusion 360 is a very powerful, very complete tool for modeling and designing all sorts of objects in 2D or 3D. You can design anything from simple, flat stickers to a complex, multi-part engine with many moving parts (and see them working together) to a house. This program can be used by designers, engineers, architects, you name it. The range of applications is mind-boggling. You can even get a free license if you only want to use as a hobbyist, so even the price is right. The pro license is also pretty affordable if you use it for your business (just over $40/month if you pay yearly, at the time I'm writing this). Can be a little complicated to use, with the user interface being a little arcane sometimes, e.g. extended tooltips describe the tool in a vague manner which doesn't provide much info to the user. Although there are a number of video tutorials available, most of them refer to older versions. There were a number of big changes in the software fairly recent and a lot of the tutorials, even in their own website, are outdated, using commands or tools that are no longer available or have changed since the video was made. Most of the tutorials/help articles are in video format, which can make it hard to follow along while trying to reproduce what they're teaching you. Also, most of the answers you find in the forums refer to older versions too. I've encountered some stability issues, with the program sometimes freezing or crashing, so make sure you save your projects often. I also wish their support for meshes was better. As it is, it's almost nonexistent... other than importing the meshes and displaying them on the screen, you can't really do much if you only have a STL or OBJ file that you need to modify. You might have to end up redesigning the whole thing from scratch if you want to change it. I currently use Fusion 360 alongside with a couple of other applications, depending on the specifics of the project. Sometimes it's easier to model objects in simpler applications like Vectary or even Tinkercad, especially if you have to start from existing STL/OBJ files.Fusion 360 definitely has a lot of functionality and it is very powerful, but it can be overkill for simple applications if you only need to sketch something out really quickly. Some prototyping for packaging and product ideas. "Fusion 360: Great 2D/3D CAD and FEA, but with an Achilles heel." The price: Around 1/10 the cost of Solidworks (software + maintenance) for your first year, and 1/4 the cost thereafter. Complete functionality on a Mac: Solidworks isn't likely to go there soon, but you can have it today with Fusion 360. Cloud-based system: Every time you open Fusion 360, you are automatically logged onto the cloud and have access to all the latest updates. Your files are there too, no matter what computer you were working on yesterday, or what continent you were working from. Autodesk has been silent about if, how, and when they intend to get their cloud-based services like Fusion Lifecycle PLM and their Fusion 360 CAD to comply with U.S. export control regulations such as EAR (Department of Commerce) and ITAR (Department of State). My company has customers who will not allow us to work from the Autodesk cloud for this reason, which essentially negates much of the value of using Fusion 360 in the first place. The lack of export controls certification with the Autodesk cloud may or may not be an impediment to some companies enjoying the significant capability and excellent pricing of Fusion 360. Consider this carefully before committing to purchasing and learning this product. For private consulting, Fusion 360 offers an economical way to access a powerful 2D and 3D CAD application without worrying about whether you'll earn enough just to break even on the annual cost of your CAD maintenance. The start-up costs are an order of magnitude cheaper than Solidworks or other so-called mainstream CAD software programs. "Good procedural software, missing a few features." I love the procedural modeling workflows used in Fusion, as you're able to save a lot of time if you have to go back edit a small piece of a part. I also like the ability to parametrically design the parts, which allows for easy clearance inputs for different manufacturing processes without having to go and edit the clearance of each part one by one. I do not like the lack of features coming from other CAD software as well as media production software like Autodesk Maya. Certain simple tasks, like selecting a loop of edges aren't implemented, which means when you want to do something as simple as filleting/chamfering an edge, you'll have to click on each edge part of the loop. Also, the error messages are extremely cryptic, having more information there would be useful. The online discussion pages for the issues people have had also seems lacking, and I think could be vastly improved by having more tutorials on platforms like YouTube. Use this for highly technical projects with stiff requirements. This software is great when you want to iterate on a part only making small tweaks until your parts fit or perform just right. In addition, many content creators, specifically those providing 3d printing related content are users of the software. This has made it quite easy to learn how to start rapid prototyping designs that would otherwise require entire redesigns each and every time a part would have to be modified. I really like how clean the program is. I've used several CAD programs in the past and I have found that Fusion 360 provides more features in a very organized and attractive manner. I also love the versatility of being able to model and stress test all in the same platform. Perfection! I occasionally run into little hiccups where things just don't work as expected. Typically I don't have issues, but when I do they can be very time consuming and frustrating to work through. It's a great platform. If you are considering getting it, look into a free trial. They let you test the program for about a month so you can really dig in and find out if you want to use it long term. I mostly design and build camera parts and motorcycle parts for several companies. Fusion 360 is amazingly well integrated. It includes a modeling and a sculpting workflow. I've also used the finite element analysis to test structural loads and optimize materials. I've used it to collaborate with others on drawings. And I've used its integration with EAGLE to produce mechanical drawings of my populated PCBs automatically so that I could design enclosures and mounts. Fusion can be buggy. But it's getting better. I've asked for and gotten specific bug fixes. Use the free trial to see if it works for you. Use the support videos to learn how to use it. Pay particular attention to the measurement and analysis options. I've in-housed my hardware design and I've used its integration with on-line machine shops and McMaster-Carr to streamline my manufacturing and ordering. "Excellent CAD and CAM package"
The flexibility to jump between CAD and Cam facilities. As I mainly use our models to produced CNC machine files the ability to jump between the two saves a lot of time. If you are looking for a machining program to create GCode fusion is very easy to use, has excellent customer service and help sections if you get stuck. It also is very flexible allowing you to create toolpaths you wouldn't be able to in other programmes. As a electronics engineer , occasional using SW for simple designs , I sniffed a Fusion and made the switch. It fordable, even for occasional users, its fast, the help system works great. Simulation is made easy, 3D printing well supported and the CAM modules looks real nice. Making relations between objects is quit different from SW, I did not get a "hang" of it. Start using Fusion on a pilot project and request demo's of the work done. I think it will show how well it works. Because its so fordable, I can take consulting jobs and use Fusion to realize the mechanical aspects of the jobs. My customers are very impressed when showing stress simulations. "Fusion 360, the circle of the CAD"
* It's the perfect environment to create 3D models. It's very friendly with all the tools that you have to make powerful renders. * The features to make inserts, hinges, gears, extrudes, etc. are very simple to use and have a perfect match between them. * You have all the tools and a lot of shortcuts juts with a few touches of your mouse or keyboard. * The transition of the different camera angles and the views of Fusion 360 are very smooth, even if your computer is not the best. * Even the representation of complex parts is very fast, having the best machine or not having it. * At the moment you have to import your old STL files that you had created with other CAD software, Fusion 360 imports the piece with many triangles and makes it very difficult to work on it. Sometimes, it's easier to start over with this directly in Fusion 360 and forget about the old. * All the files that you create are save in the Cloud, and you have to "download" every time that you want to use it. It's a very good idea when you have an internet connection, but when you do not have it, like in a plane flight for example, you can not work on it. You don't have to be afraid to switch to Fusion 360 from other CAD software. It's very simple to lear to use and very intuitive tools. In my organization, Fusion 360 is used to design our 3D prototypes for make 3D printings and test the products before the final version. I am working in the electronic development department, but we collaborate a lot with the design department because all the electronics have to fit in the prototype perfectly. We make the stuff at the same time all together. "Easy, complete very professional... and free!" The business model is unique: Free for startups and hobbyists... no time limit. After that it's reasonably priced. CAD/CAM is beautifully integrated in one package. Don't need to worry about upgrades and backup solutions. It's cloud based and everything just works. 3D rendering is not great. If we really needed this functionality we would have to look elsewhere or perhaps a plugin/integration partner. Until recently the functionality of the drawing module (output of 2d drawing for printing purpose or dxf) was very basic and inadequate. This has been addressed in recent updates and is now quite good and very useful. Give it a try. It beats everything else we have compared it to. We are a startup and this type of functionality would be completely impossible for us to obtain with the traditional expensive solutions. Going from CAD to CAM is an absolute breeze. Keeping track of versions works well and takes the manual error prone old school methods out of the equation. I started out using a student version of Inventor for doing CAD. When I was no longer a student, there was no way I could afford a copy of Inventor for my own personal use. Fusion 360 came out around then and I started using it. It was a little rough in the early days, but it's grown into an absolutely wonderful product. Being able to to have an idea, draw it up in an hour or two in Fusion 360, and tossing it over to the 3D printer... it's amazing to be able to go from idea-to-usable-part in the span of a few hours. It's dramatically reduced my prototype iteration time! The software operates on a relatively brisk release cycle. Occasionally a version gets shipped with a bug, and then that bug disappears a week or two later. Rapid prototyping! The flow from design to STL to having a printed model is super super easy. "Fusion 360 only one issue that is trying to keep up with all new fetchers." -One software does it all. - Issues seem to be addressed quickly. -No radius in the rapid links Like Powermill has. If these three things were addressed I know of another company that would switch over to Fusion 360. Fusion 360 the best all around software. Solidworks and Mastercam might want to start taking notes. -Remote access to my files when I'm at a customers place. "Excellent Value, With A Few Drawbacks"
I like that Fusion 360 runs smoothly on Windows and in a Mac environment too. The cloud-based syncing is really great for sharing, collaborating or keeping your data easily accessible. The interface is well-designed with a very user-friendly learning curve. Fusion 360 is packed with features and is constantly improving. The pricing is great and the rate of development is amazing. While there's lots to love, a few stand-out issues really drive me nuts. The tools seem to lack depth. When I want to start really controlling small details of my design, that's when it gets frustrating. Whether it's control over how fillets behave, surfaces blend or features extrude, there simply aren't enough options to satisfy an ex-Solidworks user. Yes, I'm fully on-board with Fusion 360, but sometimes I actually have to compromise on my designs because there is a lack of feature depth. Of course, there may be a way to accomplish what I've failed to achieve, but if that's the case, it's far from intuitive. Don't hesitate. It's a great tool. However, if advanced surfacing is your priority or you have an unlimited budget, look elsewhere. I use Fusion 360 to make models for rendering and animation. It's a program I can reliably open quickly, make a model and get to the rendering. I like that it's quick and affordable. Without Fusion 360, I'd have to rely on another 3D application for rendering, which is fine, but over the past couple of years, I've gotten very used to using Fusion 360. "Looks promising but lacks critical features"
Generally good modelling tools. Free for hobby and education. Cam and simulation tools. not to hard to learn comming from other modeling tools. Creating drawings is very very limited to the extent of being useless for engineering applications. its not possible to exactly rotate and orient lines to the page coordinate system. not possible to dimension paralleled to the page coordinate system. there is no drawing tools so I cant draw lines to show how something lines up, or explain something to the manufacturer. You can not edit any lines drawn from the 3d model. "Somehow this old dog learned new tricks"
Several major things work really well for me. Designing automation the integration of McMaster Carr's catalogue is game changing , as well I can quickly export directly to my 3D slicer and run a prototype in minutes. And for fun the CAM features allow me to post process to my cnc machines although takes a little longer. Being a long time AutoCAD user I find someoff the things I can do in AutoCAD 3D are far more intuitive than Fusion. And weird little things like trying to copy paste an object or 3DALIGN one componenet to another is poorly coded. I recomend you stick with it, it took me sometime and poarts still frustrate me but there are great online free resources for training, especially youtube. I think this is incredibly valuable software to learn if you are at all involved in product design. I am creating one off automation projects. Benefits are simulation and integration into various manufacturing tools, so speed of process. And lately I have been working in more organic shapes, the ability to work in a sculpt enviroment and move to an more rigid model enviroment is a game changer. "Excellent program, Modest System Requirements, Cloud Sync for File sharing & Rev mgmt is great!" Modest system requirements, cloud data management is great and I love being able to run this from multiple computers. I collaborate with others not located in the same area as me and that works very well, I can't imagine trying to manage file revisions etc when working with others. I have enjoyed occasional use of the smartphone app for viewing and rotating models to give quick feedback. Amazing that can run on a modest smartphone (Galaxy S6) so well. That's a good testament to how efficient the viewer is! With the high number of users most questions you run into have been explained well online. Nothing major, some features hard to find in the menus. Great program to try, great for hobbyists, Startups and small companies. Requires more moderate PC hardware than other programs and it runs smoothly. I haven't use CAM or FEA functions and I haven't tested functionality with larger organization so I can't speak to that. I've been using Fusion 360 as my main 3d design software for almost 2 years and have still not found any faults with it. It is very intuitive, easy to use and makes designing very quick and enjoyable. I have never used a 3d modelling software as good as this before, its fantastic. I dislike the fact that you cannot open an stl file to measure or review you have to use a different software from elsewhere for that. Use it, you wont regret it, the software is fantastic and easy to use. My personal benefits are, creating 3d designs faster, taking the 3d model and projecting it in orthographic views, getting my product completed faster, etc. "Excellent design and manufacturing environment!" Integrated CAD/CAM. We are a CNC machine shop which has used other big name CAM softwares and who also had a Solidworks license. After trying Fusion we are very satisfied. The integrated CAD/CAM is very useful for improving efficiency and has improved the quality of our machined parts by allowing us to tailor a customers CAD model before machining without having to switch software. I wish the file management were slightly different. I do like having cloud access to our files, however I wished it stored everything locally and synced to the cloud, like DropBox, as opposed to their implementation which stores on the cloud and caches locally for a fixed amount of time. I know they do this for collaboration purposes, however I would still prefer a "DropBox" style approach. I also wish they supported 2 and 4 axis wire EDM. This is the only thing I have not switched over to Fusion from our old CAM system (running a perpetual expired license just to keep wire EDM). I can hack this to work by using the 2D cutting tools like plasma/waterjet/laser then merge two 2D programs to create a 4 axis wire profile, but I am holding onto hope they may eventually implement wire EDM before I go through that effort. Just try it, it's free to try. Fusion has helped us dramatically increase our CNC machining efficiency. The CAM environment is very easy to use and offers many high end features which we used to have to pay extra for with our prior CAM vendor. The quality of parts coming off our machines has also improved due to the more efficient programming strategies as well as the integrated CAD environment, which our prior CAM vendor did not implement very well. "Collaboration and multiplatform use is excellent"
The online help is spotty for resolving an issue. The tool typically directs me to community instead of formal help tools. My preference is formal tool then community for support. Fusion 360 is worth considering. The Easter Egg hunt of finding the tools and different modeling workflow was a short learning curve that the online help system made helped adequately enough. I needed a tool to model a part as a base for my manufacturer to optimize my design for manufacturing. The manufacturer uses a competitor modeling software so the sharing was batched not real time so not ideal, but good enough. "Great price point for the functionalitly"
We are SolidWorks users that needed an affordable CAM package so that is what got us into Fusion 360 about 2 years ago. We now use Fusion about 50% of the time compared to SolidWorks. The software is constantly evolving and it is almost always for the best. There is a huge network of users and it is easy software to use personally as well due to the price point and the fact that it is free to hobbyists and students. The cloud features are convenient for sharing libraries and being able to work on projects from any work station without having to carry the files around. It also will now open native SolidWorks files so we no longer have to convert to a generic file format. The price point for the functionality you get in Fusion 360 can not be beat right now. What I don't like is that every now and then a update will hit that will have a bug and at times that has impacted our production. We also do some ITAR work, so due to the cloud based nature of the software, we can not do everything in Fusion. It does not have as many features for creating and maintaining drawings. It is not as easy to create and manage assemblies as in SolidWorks, but in all fairness, it take a different approach using bodies and components instead of components and assemblies like SW. Try it. It is too easy and affordable to not try it. Fusion is our CAM work horse. It has be able to do everything we have needed so far. "Ease of use and flexibility "
Some of the CAD features are not as strong as other programs such as Solidworks. Please add a convert entities tool. For the CAM side it is wonderful and easy to use although it has problems with certain operations not allowing you to program parts exactly as you wish. R & D , easy file sharing, quickturn around on modified parts. "Best free professional CAD on the market: Fusion 360"
It's a parametric CAD program. You could have the chance to modify 3d models after finishing the job. This feature eliminates redesigning of the projects again and again. You could reach most used design tools easily via right mouse click which opens a tool widget. Fusion 360 is a comprehensive CAD software which has a clean and understandable user interface. Fusion 360 has a cloud platform. That's good. But if you have a slow and unsteady internet connection then you could be encounter lagging and unnecessary waiting times in Fusion 360. I recommend that it is better to use it on the off-line mode. Thus you could avoid lagging in Fusion 360. I designed a lot of 3d models which were needed by my customers. It is a great solid modelling tool for 3d printing. "A real contender to the heavyweight CAM market"
Price point for the power! Keeps my overhead low while allowing me to do the same thing a $5k competitors software does. It's hard to find something i don't really like about it. I will say i use this software strictly for CAM but have been able to learn enough between several of the work spaces to be productive in all aspects of how i use it. Do it! For the price point and power its a no brainer. low overhead gives me the ability to quote low and gain new clients. "It's great, but lacks a basic feature that has been asked for by many users, yet ignored for years." Ease of use. It's fairly easy for any new user to jump in and know how to use things. I am using Fusion 360 for startup and personal use, and use it to design parts to 3D print on my own 3D printer. "Fantastic software for designing product prototypes"
Like other CAD software, the mathematical precision of the operations one can perform within the software is absolutely invaluable. Add onto that the ability to create animated rigs for simple machines with an incredibly intuitive animation kit, and product demonstrations can be easily made. The shading and material library is fantastic as well, and objects can be shaded with a simple drag and drop operation. A prototype product can be designed, animated, and shaded all within the course of a few hours, rather than tens of hours. Sometimes, the animation tools can be a tiny bit confusing when setting the direction of object motion, for instance, when creating a piston system, sometimes it can be rather easy to make the animation occur in the direction opposite to what is desired, but this is just a minor gripe to a comparatively fantastic CAD software. This software is incredibly easy to pick up, and if you have a background in CAD or know the general 3D Design terminology, then you will find this software to have a relatively low learning curve, meaning it's easy to pick up. Whenever an idea for a product is considered, Fusion 360 is usually my go-to software to create and animate the aforementioned product, as a cost effective means for creating a rudimentary simulation of that particular product and what it would achieve. 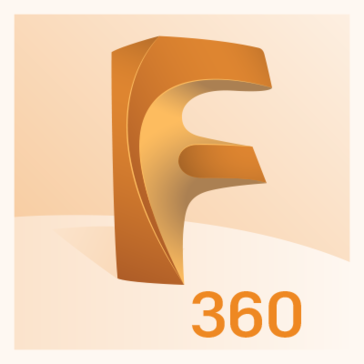 I love Fusion 360 – ever since I was a beta tester in 2013. 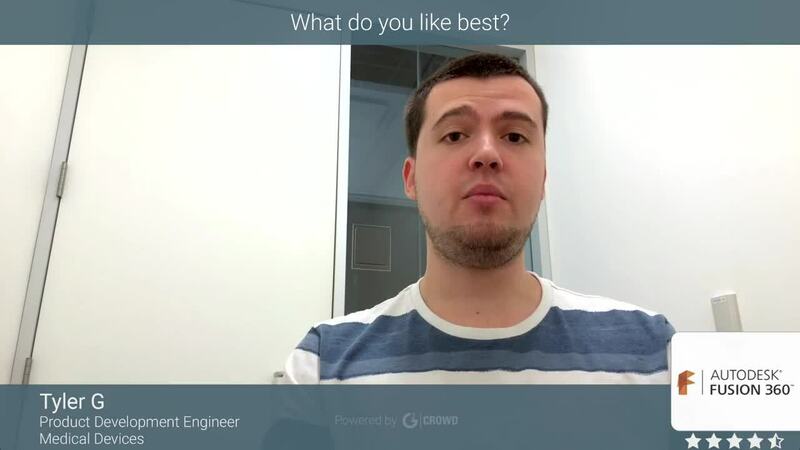 It has been a pleasure to see how well your team has evolved this product to the point where companies like mine can significantly increase our productivity. It has been great for working with subcontracted engineers who still use solidworks (for whatever reason) – your team’s approach to direct modelling makes interoperability an issue of the past. Limited ability to take ownership of models created by employees. To support our company's growth, we require, scalable, flexible, cost effective software tools which are focused on innovation and value rather than squeezing maximum revenue from dated software. Fusion has so far exceed our requirements for mCAD. I like the integration of CAD and CAM and Simulation all in one package. Being able to switch back and forth between those 3 in the design process has been a huge time saver. I'm not sure how this works but the program allows for offline design work. I have a Microsoft surface and do most of the CAD and CAM work offline and everything loads just fine. CAM and CAD still feel a little like a beta release at times. Some of the functionality is buggy and will perform differently at different times. One other example is that the mouse hover help feature when establishing a tool path. When trying to understand more about what a feature does, they will have a pop box to explain it. This is really helpful for some. Others have a half filled in help box with a missing image or text. Program will unexpectedly close or not open the first time you try clicking on it. Great value for the price. Can work well without needing a CAD computer set up. CAM and CAD can feel clunky at times. Sketch tools are a little confusing at first and it can be hard to tell where constraints are. Designing something that needs to be machined and creating those tool paths has been overall a good experience with Fusion 360. "Best step forward in years"
I love the CAM function. I've been using Vectric previously and while it is a great programme it didn't have the functionality I was looking for and when I came across Fusion 360 it did exactly what I required without the cumbersome and time consuming work around. I'd really like the ability to customise your mouse and keyboard shortcuts. I'd say go for it. I'm a novice with CAM and I managed to get my head around it fairly quickly and still managed to stay sane. "The best software I've found that allows me to design and manufacture in the same program." Fusion is an all inclusive platform that will allow the design of all the types of assemblies I do and it allows me to take each part all the way through the machining process. I really enjoy that it is cloud based so I can work in my office then go home and decide i want to try something or look at something and I can hop on my home computer and all my designs are there. And it does not require the powerhouse computer that solidworks does. Updates without permission and sometime looses all my preferences and I have to reset up my post processors. Would like better support for post processing as well. The no local support or hard to find corporate support is also a little annoying. I would really like to be able to create sketches in the cam workspace to use for machining. give it a shot it might work differently than your used to but it works well. Its one software that I can use for everything but the electrical design. "Fusion 360 - CAD for the Beginner to the Pro"
Fusion 360 incorporates easy-to use CAD tools, incredible rendering capabilities, CAM software, and even sheet metal fabrication tools. The state-of-the-art software not only features parametric modelling, but also features advanced surfacing and free-form modeling capabilities. It is easy to use and cloud-based, so files can stay put when you are working on different computers. It does lack certain features which make working on other file types a little bit of a pain, but with the amount of updates and additions the Fusion team adds in a timely manner, more features are being added to help with this. If price is a concern and you need great CAD and surface modeling tools, then Fusion 360 is for you. Fusion 360 allows me to download and analyze customer models so that I can consult with them on their projects. "Fusion 360, the easiest 3D modeling app you can find!" It's amazing how CAD programs just keep getting harder to use. Except for this one. With Fusion, everything is smooth and easy to do. All features are well explained and really intuitive. Some of the views features don't work as good as they could work. It's one of the easiest and fullest CAD program you'll find on the market, if you are doubting, give it a try! We could finally use a CAD program that didn't need hours and hours of preparation before starting to design. You just sit there with Fusion 360 and start creating. "Fusion 360 is our number one CAD !" Fusion is the best quality price CAD software out there for modelling 3d printing part. At Lezar3D, I use it on a regular base. It's easy to use and possible to edit .stl file and get plug in for extra fonction. We will recommend to any one starting to a new software related to 3D printing. Other software like Netfabb and Meshmixer are great complement with it. If you let the software to do other thing and come back, it happen to bug sometimes, so be sure to save when you quite for a break. We use it for modelling our 3D models. Fusion 360 has a really easy to use interface without too many bells and whistles to confused a newcomer. It's also free to use (depending on criteria) and has the ability to send the files for 3D printing. Since the program is cloud based, it is easy to switch computers and start off where you left off on a previous device. Fusion 360 also has a way to record the steps taken to build an object so if modification needs to be made on one part, it will change it, while keeping the other steps that might have been done before. There is no easy way to export or convert the CAD objects into an obj file if one needs to take it into a creative 3D program. Make sure to have a pretty descent machine. It's a great way to create hard surface models with a nice enough render for a presentation. "THE Tool for 3D Print Projects"
I love the simplicity of the layout and that Fusion 360 is yet very powerful, and can be complicated. With power comes complexity is many cases of course. You can design your 3D project / image(s) and then export it as an .obj or .stl file and it is ready for opening in your slicer - be it Simplify3D or Cura or any other application. Then export to .gcode and print your 3D image. The community of users is large enough that it is easy to find help if you are new to 3D applications. I can only think of one item that I dislike and that is the lack of intuitiveness - but at the same time, I think that is to be expected in a 3D application. I oversee the 3D printing that students need to do for class assignments and I also help them with personal items they produce. Often this has been useful to developing prototype images for planning. "Still adjusting, but worth it for the cloud-based system"
Fusion is great for simple builds. I love the cloud system that allows me to be able to access one license from anywhere, as well as the files. Makes so much sense. Fusion can have trouble with complex builds (freezes and closes). I also don't care for the interface and usability compared to Solidworks. Fusion is great, and the industry is definitely starting to use it more and more. It's a great way to learn CAD and decide if you want to invest in Solidworks, or stick with Fusion. I use fusion to build my designs to send out to factories to have produced. There are lots of features that help make it manufacturable, and I also like that someone else on my team can pick up where I left off. I also like that it has surfacing- kind of like solidworks and alias combined. "Fusion 360 for product development"
It's very powerful, and intuitive. I love how well I can manage my files using the cloud. The versioning is amazing. Sharing files with team members isn't always the best. Especially team members who don't have a fusion 360 subscription. Right now I can not figure out a way to make my data decentralized. Right now i have to share all my projects with several team members in case something happens to one of us. Ontop of that my boss who doesn't use Fusion can not access any of my work without me sending him a public link to the file. More options to share your Data with a team. I work in product development for a furniture company, mostly office focused products. We have used Fusion to help design desks, chairs, lighting, room dividers, couches, coffee tables and many other items. "Strong Modeler, Light on Industrial Tools"
Fusion 360 is a great 3D solid modeler and advanced TSpline surface modeler that offers fantastic usability and performance. The software runs on Mac or Windows which is nice for a mixed environment. Fusion 360 also supports just about any CAD data out there and makes working with other people's data a breeze. The CAM package and render engine inside Fusion 360 provide great results and the pricing is right in the sweet spot. Fusion 360 stores data in the cloud. While the system has wonderful up-time, the simple fact that your data resides on a server outside of your control may sway some high security entities from pursuing Fusion. The platform is always being updated as well - generally with a quarterly big update and then smaller incrementals as needed. Unfortunately, this means that features may be inadvertently broken during these many updates or new bugs may present themselves. Lastly, the software lacks many of the powerful tools found in Inventor or Solidworks - like gear generators, shafts, springs, etc. Don't expect Fusion to replace your desktop solid modeling software - yet. If you're using Inventor, Solidworks, ProE/Creo, Catia, or NX you will likely need to hang on to your heavy license for a while. Fusion 360 is a very capable modeler and the simulation and CAM packages are quite robust, but they lack the more powerful design generators, mechanical simulation, and documentation tools needed to replace the heavy engineering tools found in the other softwares out there. If you're trying to decide between Fusion and OnShape - go with Fusion. Autodesk supports the tools very well and there is an active community of users who help out one another. Fusion 360 is an all-in-one industrial design and mechanical engineering package. Using Fusion has allowed us to streamline our conceptual development and our mechanical development into a single tool and speed the process from sketch to 3D printed or machined prototype parts. Previously, we were using an integrated but discreet toolchain to achieve these results - which meant moving data from package to package and often from user to user. With all the tools we need in one software, our designers can go from idea to validated design and on to prototypes in hours or days instead of weeks or months. "great cad package with more features for less money !!!!!" I wish they had a more robust selection of pre-made fasteners and basic parts used most commonly in part design and manufacturing. Would be nice to not have to always be creating screws etc. Anyone looking to do simple to advance CAD will love fusion. I have heard there are model limitations but I have not hit them. Allows us to quickly build and test CAD parts and even allows for the easy pipeline to 3d printing. "Extensive user of Fusion 360"
I like that it has a variety of functions( T-spline, solid modelling, Rendering, CAM, etc) that I can seamlessly switch between within the same design. I also like that it is a powerful program with a clean and intuitive interface. The cloud storage of designs and could rendering features are also extremely nice. I dislike that there are limited options for exporting designs from Fusion 360 into other programs( Even other Autodesk ones). Fusion is a great software for creating CAD models quickly and accurately. It lacks some of a complex assembly functions of other software, and its rendering engine is not as powerful as dedicated rendering programs such as Keyshot. Overall good for smaller designs, but surprisingly powerful. I solved a variety of business problems including: a wearable worker safety device, a new system for loading cars onto trains, and a retail booth model for Cameras. The benefits I have gained are rapid iterations, easy rendering using the cloud rendering engine, and the ability to share designs with others without them needing CAD software. "Learning curve but not to bad"
It's a step up from tinkercad, which I have been using in the classroom. The fact that students and educators can get it for free has me trying to create lesson plans to incorporate it in to my class. Learning curve. I have experience with basic CAD programs and this was not out of the box intuitive. I'm still learning it through Lynda videos. More robust CAD program than Tinkercad reddish I have been using to introduce students to 3D printing. "Overall I like the prouct.... its complicated, but I like it. " The variable based design and the ability to generate CNC prifles. CAM Is really confusing. I wish the inputs for the setup and the inputs for the dimensions for where to start a certain cut were better defined in the windows. Be ready... its complicated, but really powerfull. I build furniture and do a bunch of CNC work. Fusion gives me a platform to 3D model, and also show what I can build. It really helps me get an idea of what materials are needed and gives me a really good cut list to use later. "Fusion 360 is a great package"
* We monitor all Fusion 360 reviews to prevent fraudulent reviews and keep review quality high. We do not post reviews by company employees or direct competitors. Validated reviews require the user to submit a screenshot of the product containing their user ID, in order to verify a user is an actual user of the product. Hi there! Are you looking to implement a solution like Fusion 360?